MIAMI — Captive diners know that a good meal is hard to find. Florida, a state with a substantial Jewish population and the third-largest prison system, stopped serving a religious diet to inmates in 2007, saying it cost too much and was unfair to other prisoners. Several inmates have challenged the move with little success. Last year, though, the United States Department of Justice sued Florida for violating a 2000 law intended to protect inmates’ religious freedom. The federal judge in the case issued a temporary injunction in December, forcing the state to begin serving kosher meals by July until the issue is decided at trial. Florida is one of only 15 states that do not offer inmates a kosher diet systemwide. Kosher food in prisons has long served as fodder for lawsuits around the country, with most courts coming down firmly on the side of inmates. As long as inmates say they hold a sincere belief in Judaism — a deeply forgiving standard — they are entitled to kosher meals, even if takes a little chutzpah to make the request. In Florida’s prison system. which faces a $58 million deficit, money is the easy answer for the battle against kosher food. The cost of three kosher meals in Florida is $7 a day, a big jump from the $1.54 for standard meals, Mr. Crews said. In New York State, where 1,500 inmates out of about 56,000 keep kosher, the cost of a kosher meal is $5 a person. In California, where some prisons have kosher kitchens, the price tag is $8, and the meals are served to 0.7 percent of about 120,000 inmates. Last April, facing an inmate lawsuit, Florida began a pilot program for the religious diet at Union Correctional Facility near Jacksonville. Initially, some 250 inmates signed up, Mr. Crews said. 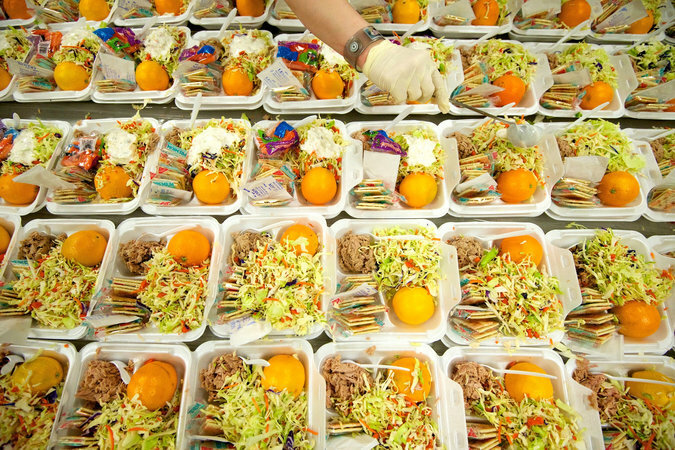 But once other inmates spied the individually boxed lunches, 863 expressed a sudden interest in keeping kosher. Prison officials began to fret that if those numbers held, the cost of the kosher program could reach $54.1 million statewide. “You are talking about a lot of money,” Mr. Crews said. But lawyers and chaplains said prison officials were inflating the numbers as a scare tactic, a common move in some states. “They are trying to make the problem bigger than it is,” Mr. Rassbach said. And even if it did cost $54.1 million, budget anxiety is not a compelling enough reason to deprive an inmate of a kosher meal, the courts have ruled. When the meals are first offered in prisons, demand for them jumps and then begins to wane. For some, the choice is genuinely religious. But some inmates, gentile or otherwise, have been known to profess a belief in Judaism for decidedly secular reasons, chaplains said. In a world of few choices, the meals are a novelty, a chance to break from the usual ritual of prison life. Others believe the kosher turkey cutlets and spaghetti and meatballs simply taste better. But some see it as a safer bet. 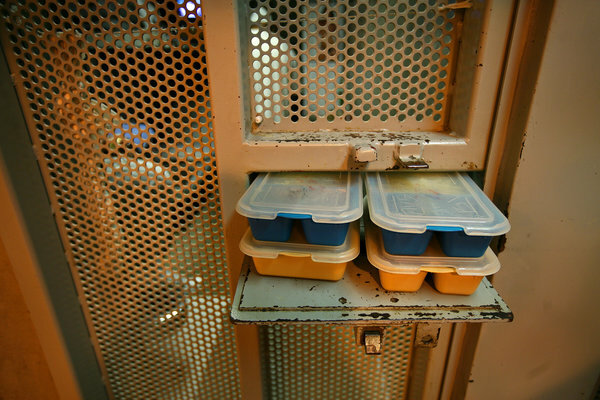 “If they are using prepackaged, sealed meals, the inmates believe they are safer,” he said. In the past, some gang members have declared themselves Jewish so they could sit apart, in the kosher meal section, and talk business. The meals are sometimes bartered for coveted items. The courts steer clear of that perilous debate. Instead, inmates need only say they have a “sincerely held” religious belief. Attempts by prison officials and rabbis to quiz prisoners about the Torah and the rules of keeping kosher were ruled not kosher. Tracing maternal lineage was similarly viewed unfavorably. “Knowledge does not equal sincerity,” Mr. Friedman said. Some states, like New York, do nothing to try to discern who is feigning Jewishness. In California, inmates talk with a rabbi who will gauge, very generally, a prisoner’s actual interest. But some Jewish groups in Florida are pushing for greater control, which may pose a difficult legal hurdle.